Yesterday I am leaving the house to go to the gym when I see the Fed Ex truck circling the cul-de-sac. He stops in front of my house just as I'm opening the car door, and I was wondering why until I saw the tiny box in his hands. He had a box of Albert and I needed to open it. I opened it right where I stood on my driveway using my keys to tear the tape. You can click on the cards to see all the subgrades for both. Despite the argument both ways about to grade or not to grade, at least now I know that they will be protected for years to come. I can always pick up spares that are not in mint condition for my binder later if I want to (which I can bet that I won't). For whatever the reason may be, there are certain players rookie cards I don't like to keep in my binders just in case something were to happen, i.e. page creases or binder falls and damages a page or pages. It sounds crazy since I am super careful but you never know. I think grading is a good idea when it comes to a key card. It certainly doesn't hurt anything and why take any chances? 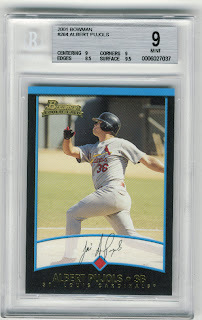 I remember my first BGS grading. I had discovered that I had an '86 Topps Jerry Rice. It was/is in absolute horrible shape. I must not have cared very much about football cards back then, much like now. I had a freebie grading coming to me from Beckett, and since I had nothing else at the time that I cared to grade, and since I wanted to see just how horrible stingy Beckett thought it was, I shipped it out. It came back a 4.5. I would never pay money to have a card in that shape graded, even if it was a Rice rookie card. Nicely Done! I hear you about certain RCs in binders--I think that it is just paranoia, but I just moved all of my Granderson RCs into Toploaders, and recently did so to his Autos/Relics as well. 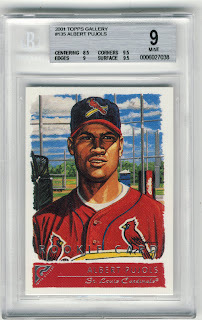 I think there's something wrong with the edges in 2001 Topps Gallery because I got a 9 on the edges of my Pujols as well. I don't know, but I don't remember anything wrong with the edges. I expect a lower grade on edges with black bordered cards because it's so clear to see, but who knows. I think they grade the edges of black cards on a curve. I have had a couple of comics graded and the rarer the comic, the harder they grade. Red Hot Rookie Redemption In Hand!